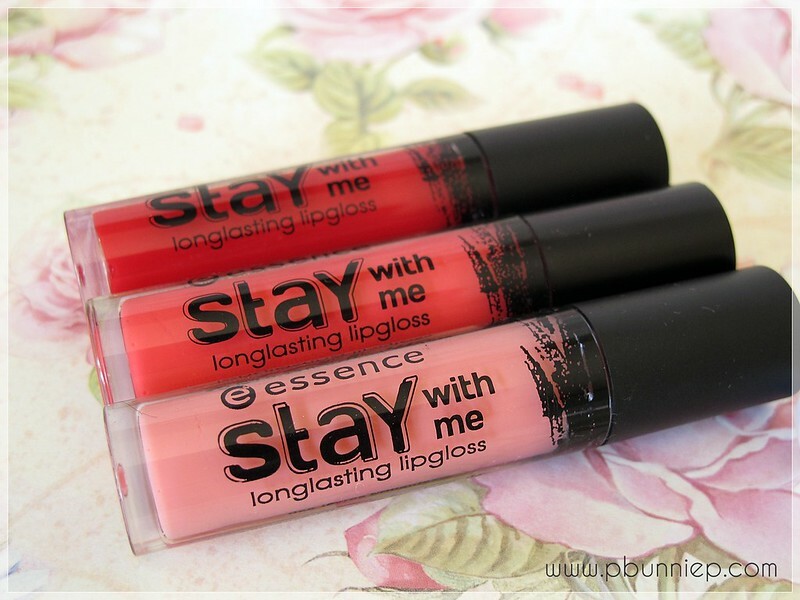 Drugstore lip glosses come and go but there's many aspects that go into a good gloss. While the main purpose of a gloss is to add shine, I like mine with a kick of colour too but that's often where it gets complicated. Many drugstore options tend to travel beyond your lips or the colour settles into every line and wrinkle. This recent love of mine (recommended by Miss Natty) is one of the few drugstore glosses for which I went out to repurchase multiple shades. Would I repurchase: Yes, I already have. Let's start from the top down, I must say that the packaging for this gloss is quite adorable. Not overly kitschy but not cheap and boring either, it looks more expensive than $2.99 and it has a good weight in my hands. Essence markets itself to be a very hip and trendy inexpensive makeup line but certainly has more to offer than what you may think. It has a funny little "snow man" sponge tip applicator (much like the Liz K gloss) and I think it's just going to be one of those love it or hate it bits about this product. I find it decent for applying product to large areas of the lips but very had to define the edges, especially if you are using a brighter colour. It's also candy/fruit punch scented which smells a little sickly strong in the tube but doesn't linger long on the lips. There are a total of 7 shades available ranging from sheer pinks to deep raspberry reds, a combination of both warm and cool tones to suit your whim with a focus on cream finishes. All the shades I own or have swatched have light to medium pigmentation (the brighter ones being slightly more opaque) which makes them fabulous to wear on their own or to add more dimension to your favourite lip colour. My favourite aspect of this gloss beyond the colour payoff is the balmy consistency of the formula which smoothes over the lips like a lip balm and does not enhance lip lines at all. Even the pale baby pink, a shade which can settle unevenly on the lips, applied super smooth and made my lips look plump and juicy. Plus my lips were not parched and dry after it wore off which happens frequently with inexpensive glosses. Because it's not too wet or slippery, the colour stays put a bit longer than others and the bright shades didn't bleed around the lip line either so you can wear that red with confidence. 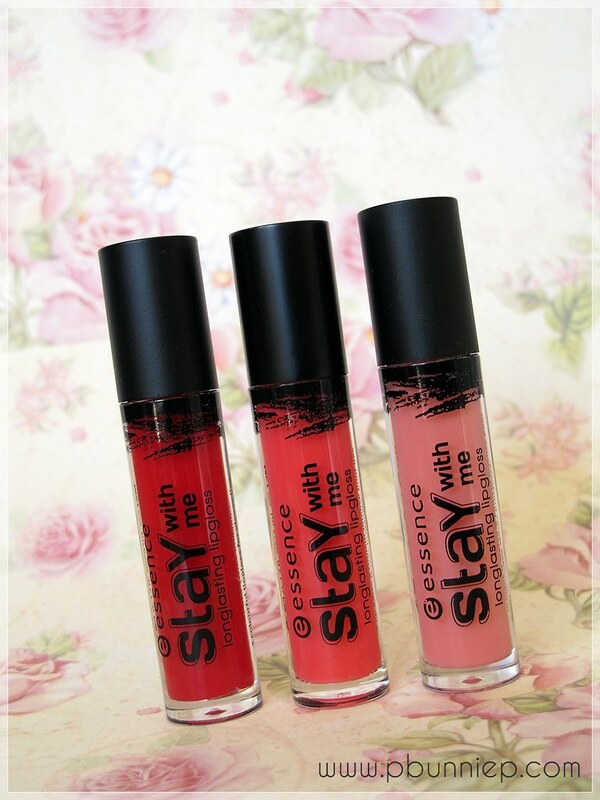 Really, this is the perfect gloss for those who normally don't like gloss at all. Altogether I am super impressed by this little gloss and it's a drugstore pick me up that I can see myself repurchasing for a long time plus recommending it to anyone who will listen. 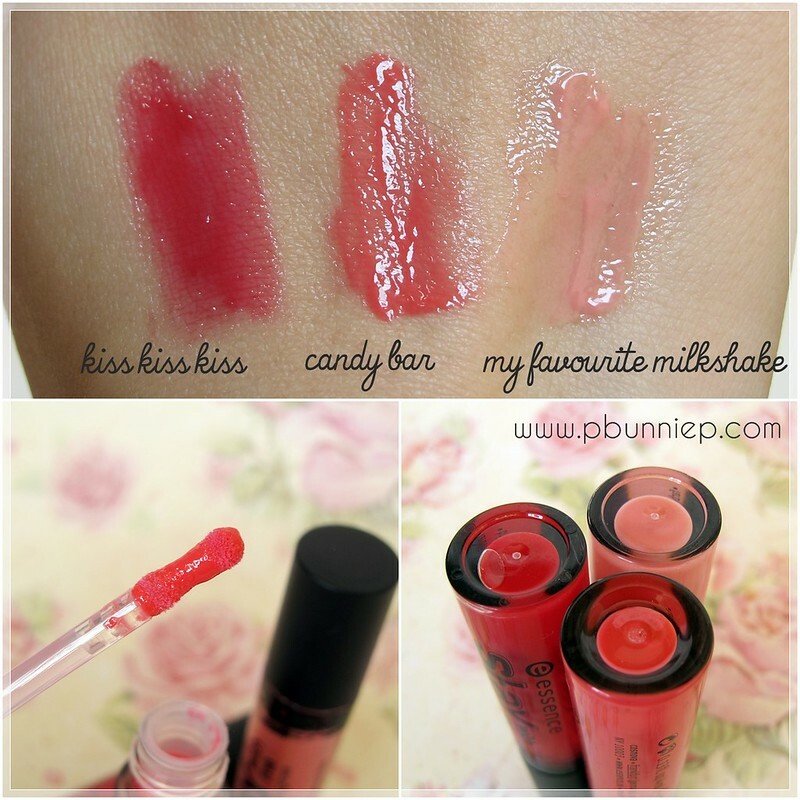 It's a wonderful tinted balm-gloss that will fit nicely into any makeup collection. So the next time you find yourself browsing the makeup shelves again, head over to the Essence stand and pick up one or three to try. I'm quickly growing very fond of this Polish brand and have a few more items lined up for review. These European brands are absolutely rocking my world recently. Have you tried this or any other Essence products before? INGREDIENTS NO 01, 02, 03, 04, 05, 06, 07: HYDROGENATED POLYISOBUTENE, ISOSTEARYL ISOSTEARATE, OCTYLDODECANOL, BIS-DIGLYVERYL POLYACYLADIPATE-2, PARAFFINUM LIQUIDUM (MINERAL OIL), SILICA DIMETHYL SILYLATE, ISOPROPYL PALMITATE, HYDROXYSTEARIC ACID, PROPYLENE CARBONATE, CETYL ALCOHOL, GLYCERYL STEARATE, PEG-75 STEARATE, BHT, CETETH-20, STEARETH-20, METHYLPARABEN, PROPYLPARABEN, PARFUM (FRAGRANCE), HEXYL CINNAMAL, LINALOOL, MAY CONTAIN: CI 15850 (RED 6 LAKE), CI 19140 (YELLOW 5 LAKE), CI 45410 (RED 27 LAKE), CI 75470 (CARMINE), CI 77742 (MANGANESE VIOLET), CI 77891 (TITANIUM DIOXIDE). They discontinued the line here (Belgium) :(. I had one and it's really greattly pigmented and balmy like you said, but mine had a weird taste tho. I think it was only that shade tho. Essecne updates their line every 6 months so yeah, it's gone here, meh! I'm from Germany and essence is well known here, different from what you say, cosnova (essence is one of their labels) is a german company. I don't know if you have the same range over there, but you should try the eyeliner. It's inexpensive and the best eyeliner I know in the drugstore segment. I hope I could help you a little bit. And thanks for your great blog and awesome videos! I will keep following you! So nice of you to stop by, I love it when people from other parts of the world come to say hi! I'm currently loving the Essence Get Big Lash mascara which is surprisingly fabulous. We don't have the entire range here (none of the limited edition products either) but I'll keep an eye out for the ones you mentioned next time I'm in the shop. Sometimes they update the line with a few new items. We don't have Catrice here yet but I've heard lots about them from other European bloggers...hope they will release it here eventually!